We offer a mobile app for creating 3D virtual tours along with 2D photography DIRECTLY ON A SMARTPHONE. 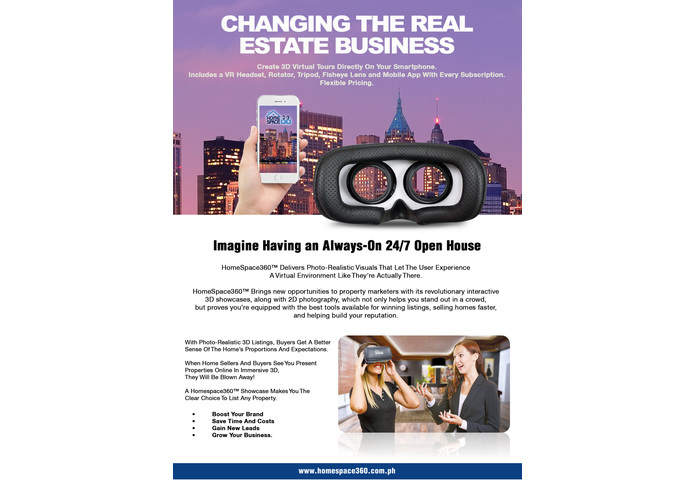 Lowering the barriers to entry for real estate professionals who don't have budgets for 3D virtual tours, nor have the technical inclination to learn how to operate a complex 3D camera. 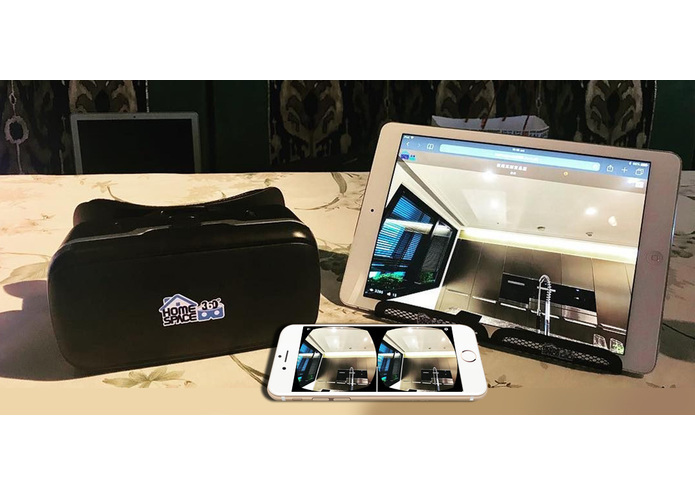 HomeSpace360 is a revolutionary mobile application that empowers property marketers to create 3D virtual tours along with 2D photography directly on a smartphone. The HomeSpace360 APP captures all your spaces in 720° in 3D right from your smartphone. It’s an authoring system for creating virtual tours from a series of 720° spherical images captured on your smartphone. These tours can be viewed in 2D on a PC, Tablet, or smartphone by panning with your finger or moving the device around. The tours can be viewed in 3D when viewed with any entry-level VR Headset. Viewers can 'hop' between the linked scenes by gazing at the hopspots you set up. You can also add labels or information to various targets. HomeSpace360 makes it easy to turn your property listings into a compelling, immersive VR experience. With over a decade of experience in developing 3D solutions, proprietary 2D to 3D engines were developed in-house for extracting 3D data from 2D information. How to create stereoscopic-VR (VR in 3D) images from a singe lens camera (smartphone or any conventional camera) for photography and videography, cost-effectively, quickly, and while masking the complexity of 3D technology. Our goal is that anyone who knows how to take photos with a smartphone can create 3D-Virtual tours easily. This is the only fully automated mobile solution which creates 2D and 3D 720-degree virtual tours in 8K resolution directly on a smartphone. We need only capture one (1) photo per room Vs. The Matterport 3D camera requires the operator to capture a photo every three (3) feet. Our resolution is 8K Vs. Matterport 3D camera delivers 4K. Our cost is 1/10 the cost of creating and hosting a Matterport 3D tour, and 1/2 the cost of creating and hosting a 2D 360 tour using the Theta 360 camera and platform, or similar consumer-grade 360 camera. (We've done the math for validation). With HomeSpace360, 3D Virtual Tours Have Never Been So Easy, So Accessible, Or So Affordable… 6 cents per tour per day. Nowhere in the world can real estate professionals avail a 3D virtual tour for 6 cents per day. Technically, too much to describe as we had to overcome insurmountable challenges during the past three years or development. But I've also learned while developing the tech is a major challenge, launching a company with a well prepared Go To Market plan and budget is just as challenging, if not more. 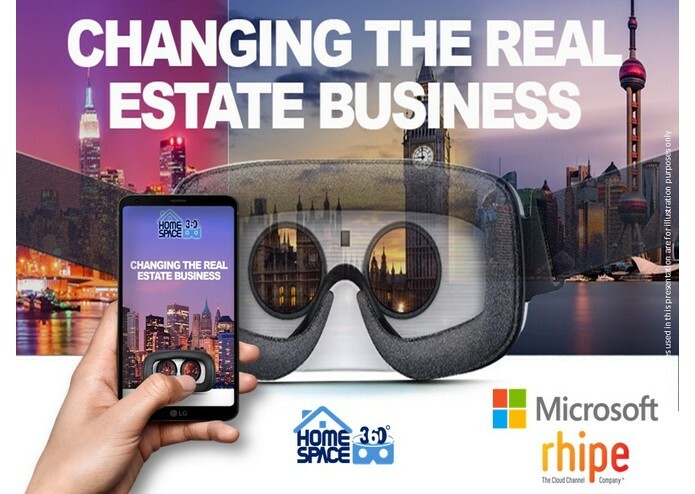 Go To Market: Microsoft has partnered with us, supporting HomeSpace360 through its Liberty Program as one of the innovative solutions in the Real Estate Industry. HomeSpace360 has just been launched for the Philippine market initially, and will roll out across other markets by December of this year. https://news.microsoft.com/en-ph/2018/10/03/changing-the-way-we-view-real-estate/ . We're excited to embark on this journey with Microsoft given the support they'll be offering us in so many countries. New Features: We'll be adding a live-chat remote access VR solution in the coming months to help brokers and agents sell properties internationally through a live VR chat in 3D. Brokers can see what the prospective customer is looking at while talking them through the sales pitch. This tool helps brokers stay in control of the discussion despite the distance between them and the prospect. Given the growing popularity of aerial drone videography, we're in the final stages of adding a powerful feature which converts 2D VIDEO from a phone, or any camera, such as one mounted on an aerial drone into stereoscopic-VR. AR features are currently under development along with some machine learning (AI) capabilities to improve the user-experience, as well as generate additional revenue. 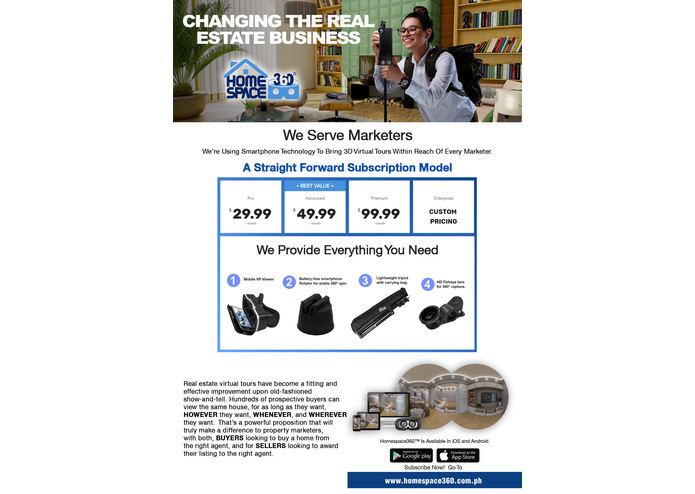 We are delighted to announce that HomeSpace360 has signed a partnership with REMAX Philippines to equip their property agents with tools which easily create 3D virtual property tours directly on a smartphone. Our collaboration will reduce agent’s marketing costs, win more listings, and sell properties faster.